Twenty-four artists rose to the challenge of producing a piece of art in an hour's time (plus 15 minutes to frame it) as a benefit for the AIDS Services Coalition in Hattiesburg, MS, last Sunday afternoon. South Mississippi Art Association sponsored this second annual event. Ticket holders milled about the huge Bottling Company (the 100-year-old former Coca-Cola bottling company remodeled as a lounge) enjoying food and drink as they watched the artists at work. John Wooten's steel drum and singing provided great background music. As he kept the artists posted on the remaining time on the clock, his music added a psychological boost. Beautiful island music in the early part, becoming more fast-paced the closer we got to the ending bell. Artists worked in oil, watercolor, pencil, and--ta-da--fabric. We were allowed to bring a beginning rough sketch to begin our project. I had fused my fabric elements onto the background piece and layered it with batting. I brought the threads and Neocolor II crayons I needed to embellish the piece, along with my table and Janome 6500 and scissors and a few pins. The finished piece fit into an 11x14 frame and brought $200 at the live auction. The event is definitely not for the cautious and intimidated--a great way to help us gain confidence in our decisions and creativity. The visitors enjoyed asking questions and watching the artwork take shape. It was interesting to hear "Oh, that's the way you do that!" The local newspaper, the Hattiesburg American, devoted 3/4 page in the 1/18/09 Sunday paper to three photos and captions about the show--pretty exciting! The invitation piece, Regenerating Fire, sold, breaking up the four elements. However, it was so much fun to make that I just might repeat it. A cold and windy night did not keep a large crowd from attending the Opening Reception. There were 39 pieces in all--two full-size quilts from my hand-quilting days displayed along with quilts for the walls down to 5x7 framed pieces. My quilting friends and my art association friends had to come, but even my tennis friends came! What a rewarding and humbling experience for me to be able to share my passion with friends, university faculty, staff, and students, and art lovers from the community. Many people were surprised to see the variety of techniques and materials displayed, when their expectation was to see handwork like they remember their grandmother making. Chatham Meade, curator and director of the Lucile Parker Gallery, is pictured with the Kitchen Garden series--thread-painted vegetables and a large appliqued pumpkin. Chatham Meade, curator and director of the Lucile Parker Gallery, said, "Mrs. Ginn and her work with fiber materials truly enhance the Hattiesburg community as well as the art world of Mississippi. 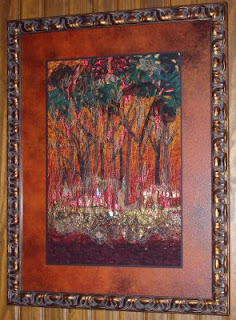 Her work includes both nontraditional art pieces which are her original design as well as more traditional quilt pieces. Her work includes the use of transparencies, metallic threads, and other fiber related materials not traditionally used in fabric pieces. Mrs. Ginn's work celebrates the beauty of Mississippi by creating art from the forms, shapes, patterns and colors of leaves, trees, flowers, land forms, celestial bodies, and other natural objects in a way that is truly unique to her and of her own design and creative innovation." http://www.wmcarey.edu/AboutWCU/GalleriesandCollections/1149/LucileParkerPhotos.shtm for photos of works from the exhibit. Following the current exhibit will be solo exhibits by Tommie Rodgers of Laurel, MS, and Chatham Meade of Hattiesburg, MS.
January 19, 1809-October 7, 1849. Quilters and fiber artists are commemorating the 200th anniversary of this mysterious poet's birth by creating postcard-size pieces (4"x6"). These will be submitted for display online and later donated to Collage Mania, a fundraiser for the American Cancer Society, coordinated by Virginia Spiegel. Virginia's previous efforts have raised more than $165,000 for the ACS through her Fiber For A Cause projects (The Collage Mania link is: http://www.virginiaspiegel.com/CollageManiaCall08.html.) Reading about Poe's life and his work has been a delightful excursion! Wikipedia is a goldmine of accessible information. My piece is created on a white antique linen napkin with Poe's name, birth/death dates, and R.I.P. penned with a Sanford permanent pen. The raven is appliqued black satin with black and purple/blue/green variegated polyester threads. His eye is a yellow fabric circle (like the beak), with a gold sequin, a black star, and a white seed bead. The heart is red felt.